In the Republic of Ireland and Northern Ireland always remember to drive on the left hand side of the road. Signposts and place names are displayed in both Irish (Gaelic) and English. Distance signposts and speed limits in the Republic of Ireland are in kilometers. In Northern Ireland signposts and speed limits are all in miles. 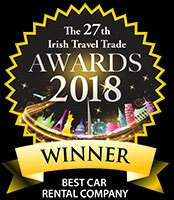 Visitors to Ireland must have in their possession a valid national driving licence to hire a car and carry it with them at all times while touring. Seatbelts must be worn at all times in the front and back of the vehicle. There are very strict laws on drinking and driving and the best advice is simply don’t drink and drive. Don’t park in unsuitable areas and never leave valuables on view in the car. Hertz ensure that the rental fleet in Ireland is safe and road worthy to protect our clients. It is the client’s responsibility to drive carefully on the road. Please remember that rural roads in the Irish countryside can be quite narrow. Slow down, take care and abide by the local laws. To familiarize yourself with the rules of the roads in Ireland visit Rules of the Road and for tips on driving in Ireland please see the Road Safety Authority website. The number of tolled roads in Ireland has gradually increased in the past few years. Motorway tolls generally cost between €1.90 and €5.10 and are payable by the renter at the tolling booth with the exception being Dublin’s M50 barrier free tolling. Ireland is no different to any other country, if you park in restricted areas you may be fined, and/or the vehicle towed away. Renters are fully responsible for payment of Parking fines, clamping charges and all Road Traffic fines.